I recently attended the Literacy and Leadership Institute in Madison, WI. It was hosted by Regie Routman, creator of the Reading-Writing Connection professional development series (which my building uses). This may have been the best conference I have attended. Everything was connected to best practices. A lot of what the presenters at this conference shared is based on research and publications by Richard Allignton and Peter Johnston. Summarizing all that I learned into one post would be like trying to stuff an elephant into a foot locker. Instead, I attempted to synthesize my thinking by creating a walkthrough checklist connected to best literacy practices. It is based on an article published by Richard Allington in Phi Delta Kappan in 2002, titled “What I've Learned About Effective Reading Instruction From a Decade of Studying Exemplary Elementary Classroom Teachers” (a straightforward if not catchy title). I condensed his findings about what exemplary teachers do into twelve statements. Students are actually reading and writing around 50% of the time. Students are reading independently, meeting with the teacher for guided reading, and/or reading and writing in the content areas. Students are reading texts that allow for high levels of accuracy, fluency and comprehension. Classroom texts reflect a broad range of interests, diversity and levels. Teacher gives direct, explicit demonstrations of thinking strategies that good readers and writers use when they read and write. Teacher assigns work that is responsive to students' needs and fosters a transition of thinking strategies to independent use. Teacher facilitates lots of purposeful dialogue – both teacher/student and student/student. Classroom talk is more conversational than interrogational. Teacher assigns activities that are substantial, challenging and complex. Students are allowed some choice and autonomy in work to promote ownership and engagement. Teacher evaluates student work based on effort and growth rather than just achievement. Students take responsibility for their scores with the help of clear and visible academic expectations. Using this checklist as a Google Form on my iPad, I could walk through classrooms and document how often best practices are occurring. Teachers are already used to me being in the classroom to read aloud or just observe. Is this a logical next step? It was suggested that if a checklist is used to document frequency of best practices, it needs to be sandwiched with positive feedback, probably in the form of a written note and verbal praise before leaving the classroom. I will defintiely need to reference Choice Words and Opening Minds by Peter Johnston often as I begin providing feedback. A hybrid of both a checklist and a written narrative may work best for my staff and me. If I was the teacher, would this checklist along with a short observational narrative have the potential to help me improve my own practices? Would I feel defensive and nervous, or wonder what my principal's motivation is? As the principal, will this type of walkthrough give me a reliable set of data to help determine where we are growing and where we need to grow? Could I eventually expect the teachers to use this process and observe each other, using a peer coaching format? I need to sit on this draft of an idea and come back to it later. I would welcome any feedback! When I moved into my new office last August, I found approximately 800 green pencils with “I Read to the Principal” printed on them, left for me by my predecessor. In my last blog post The Principal as a Writer, I wrote about how I modeled writing for my students and staff using Moleskine notebooks and a document camera. The modeling component of instruction is essential, but so is giving students the opportunity to practice their skills. As I have learned, student work should be authentic and relevant to their own lives. 1. They only put books in the journal that they truly enjoyed (four out of five stars or better). 2. They had to write to an audience, namely their classmates, their teacher and me. 3. They had to include their name as the reviewer. The idea behind this is classmates would presumably read the book review journal looking for their next great read. When they found a book that interested them, they could talk to the reviewer to get more information. 4. When students completed a review, they were encouraged to read their review to me in my office. Their purpose was to convince me to read the book they liked, as I had limited time to sort through all the literature out there. Moleskine journals were now available in an opportune place in the classroom. Student book reviews commenced! Some classrooms used them more often than others. When I had not recently received a visit from a room, I again modeled a book review for that class in my own Moleskine journal, then encouraged the students to do the same. Here is a third grader reading aloud his book review to me back in April. This is the book that he was trying to convince me to read through his review. He had me at “gruesome”. Young children do not need to know all their letters and sounds before they can write stories and read back their own writing. Shared writing text involving common experiences are often the easiest text to read. – Writing for an authentic purpose is so critical. I couldn’t imagine writing this very post if I didn’t think I had an audience to read it or an opportunity for some constructive feedback. I imagine students feel the same way. – Book reviews are a form of persuasive writing, an essential skill for students and for informed citizens. – The reading-writing connection is a concept stressed by Regie Routman and other literacy experts. Reading makes better writers, and writing makes better readers. – As a principal, this is another opportunity for me to visit with students in a positive context. Dial 811: It’s a Poetry Emergency! Have you noticed that the call number for poetry books is 811? And that it is similar to the more familiar number 911? Neither did I, until I became principal at Howe Elementary School this year. One of the many cool things that occur in my school is the concept of a “Poetry Emergency”. Developed by Liz Ottery, reading resource specialist, and other Howe staff five years ago, the school spends April recognizing National Poetry Month. Before the month begins, Liz asks staff members not teaching in the regular classroom to “adopt” a grade or class. I snapped up 5th grade, which happens to be the former grade level I taught before I entered the principalship. During this month, we were expected to spontaneously pop into our classrooms and read aloud poetry. Liz gives us a sign in red; on one side it has the numbers “811”, and the other side reads “Poetry Emergency”. Before reading aloud, we hold up the sign and announce “Dial 811: It’s a Poetry Emergency!”. We then share our favorite poems with the students. In my case, I chose to read aloud Judith Viorst’s If I Were in Charge of the World and Other Worries to my 5th graders. These poems speak well to this audience, hitting on topics such as peer pressure and making friends. During this time of the year, the classroom teachers also teach a variety of poems to their students. They can range from diamanté in 2nd grade to free verse in 4th. What I enjoy as I walk in the hallways is reading all of the students’ poems hanging on the walls. Taking time to celebrate our students’ efforts is so critical in building the idea that everyone can be a writer. 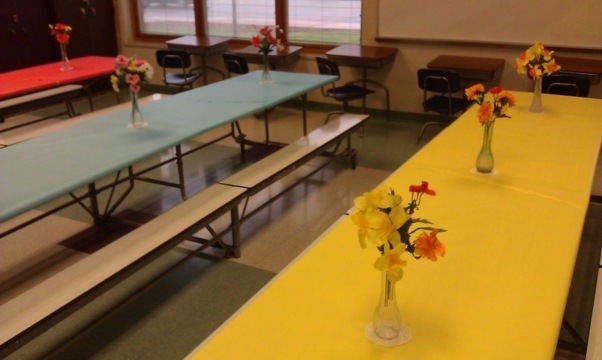 At the end of the month, Liz sets up Poetry Cafe in the cafeteria. This is an opportunity for students to read aloud their favorite poems to their classmates, teachers and families. 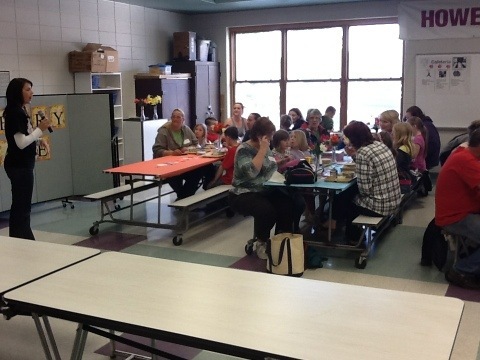 As you can see, Liz creates a great environment for this parent involvement activity. Once classrooms are signed up to present, family members are invited to school to listen to their children read aloud poems they either discovered or wrote themselves. In this photo, a second grade teacher kicks off the cafe. This idea for promoting poetry writing in school is just too good not to share. Author Matt RenwickPosted on April 16, 2012 May 1, 2012 Categories Community, Reading, WritingTags poetry, Principal as a Reader, principal as a writerLeave a comment on Dial 811: It’s a Poetry Emergency!